Turning twelve is a decisive occasion in one’s lifespan. It’s the year just before the teens. Whether people or entities, the 12th year is critical, when one explores and strives to expand perspectives. So when the 12th edition of Zee Jaipur Literature Festival opened on January 24 at the Diggi Palace, everyone, from the festival organisers — festival producer Sanjoy K Roy, festival directors William Dalrymple and Namita Gokhale, publishing houses, authors, speakers and importantly visitors — readers, non-readers, art lovers and music fans, were all looking at what the Jaipur Literature Festival 2019 would deliver in the following days. With a line-up that boasted names such as Pulitzer Prize winning author Andrew Sean Greer, Yann Martel and Ben Okri — both Man Booker Prize winners, Australian writer and a prominent voice of the secondwave feminist movement Germaine Greer, Hari Kunzru — one among the Best of Young British Novelists recognised by Granta in 2003, author and MP Shashi Tharoor, lyricist Gulzar and his filmmaker daughter Meghna Gulzar, actor Manisha Koirala who launched her autobiography Healed, lyricist Javed Akhtar, actor Shabana Azmi, authors Anjum Hasan and Jayant Kaikini, poets Ruth Padel and Rajathi Salma and nearly 500 other speakers, it didn’t come as a surprise that the world’s largest literary festival drew over 400,000 visitors. On day one of the festival, among the star speakers, the father-daughter duo of Gulzar and Meghna Gulzar were the biggest crowd-pullers. Meghna’s book on her father titled, Because He Is, though published in 2004, continues to engage Gulzar’s fans across the globe. Talking about her approach to the biography, Meghna said, “It’s the lack of objectivity that is the charm of the book. There’s an emotionality that makes it more honest.” But it was her recitation of a poem she had written as a child that evoked a roaring response from the audience. The poem read: “I have a father who gives me money. I’d hate him not rather, he loves me as honey. I love my father too, he polishes my shoe. He’s sometimes sweet, sometimes funny, but today, I want money, so away he is running!’ The session concluded with the father and daughter praising each other’s abilities to strike a balance in their relationship, even as friends. Ben added his perspective: “Myth is not just what we make of life. It’s also cycles and rhythms.” He was referring to intuitional writing, which does not make a direct effort to replicate reality. Instead, it uses rhythms to convey the experience of a story. The conversation ended with the writers sharing their evolving writing styles, and Tania confessed, “My stories are getting shorter and shorter,” helping her experiment more. While Vikram said, “I am much more suited to the longer craft,” and Ben added, “The short story betrays itself in every sentence, which is consequently more scary, while the novel is a more generous and forgiving form.” This repartee between the authors drew a resonating applause. The more thunderous clapping, hooting and cheering was reserved by the crowd for the session, ‘Eleven Gods and a Billion Indians: Will Virat Kolhi be The Biggest Celebrity if Indian Wins the World Cup?’ — a discussion featuring Boria Majumdar, author of Eleven Gods and a Billion Indians, TV journalist Rajdeep Sardesai and MP Shashi Tharoor. The panel was in conversation with authorjournalist Prayaag Akbar about what makes the Indian cricket team worship-worthy. Boria shared his experience about writing the book and how during the Anil Kumble controversy, Kohli held the ethos of the gentleman‘s game through his approach and behaviour. But it was Tharoor who drew the maximum applause for his acidic yet witty remarks about the current affairs of the country within the cricket context. While the panel was divided on who makes for a better India story (the making of a hero from an ordinary Indian) — MS Dhoni or Virat Kohli — the concluding statements on the cricket World Cup winners prediction seemed unanimous, that India does stand a chance to win it. Day three witnessed a medley of subjects that included travel, race, migration, colonisation, climate change, desire, love, mythology, art and Bollywood. It was also a day of many women-centric exchanges, one of which was ‘The Changemakers: Bollywood Behind the Scenes’. The conversation between authors Gayatri Rangachari Shah and Mallika Kapur (who wrote Changemakers: Twenty Women Transforming Bollywood from Behind the Scenes), cinematographer Priya Seth, producer Guneet Monga and stuntwoman Geeta Tandon, focused on the perils of being a ‘behind-the-camera’ professional and how challenging it is for women to assert themselves in one of the biggest film industries of the world. She observed that while beauty is derived from one’s “mitochondrial DNA”, the aura of one’s inner beauty is of much more significance. She also insisted that young people must focus on living and leading with confidence, without the requirement of the reassurance resulting from artificial physical customisation. 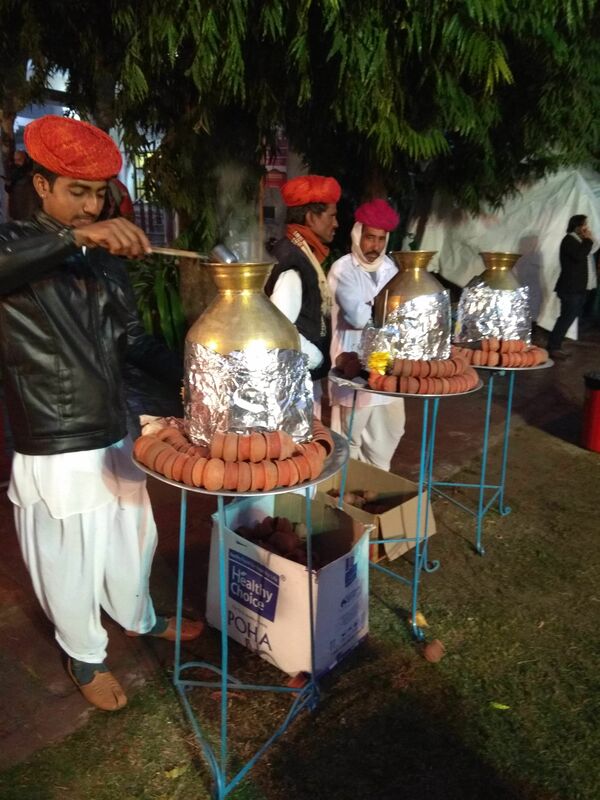 With such insightful sessions, readings and book launches, the primary venue of the Jaipur Literature Festival, Diggi Palace, was the epicentre of intellectual exchange. JLF hosted over 500 speakers from 30 countries in over 250 sessions. 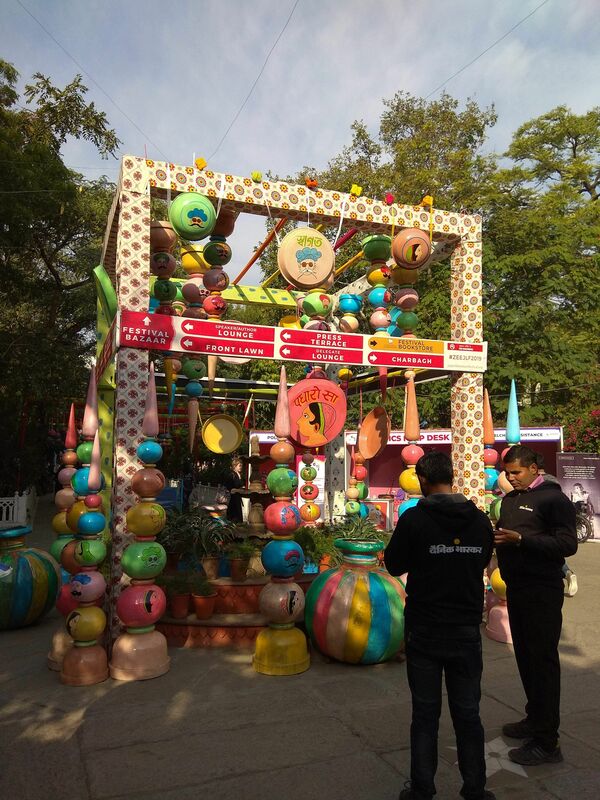 With a focus on subjects ranging from classics, war, espionage, intelligence, politics, climate change, gender, entrepreneurship, science and technology, mythology, crime, history, cinema, art , activism and more, the 12th edition of JLF certainly expanded perspectives, and is ready to go onto its 13th edition! ‘Clothing as Identity’, a fashion show by artisan designers from Kutch. The designers showcased indigenous weaves, block prints and tie-and-die prints in different silhouettes. A literary experience by Man Booker Prize winner Ben Okri, who presented The Griot — a new kind of live literary experience in the tradition of bards and griots, ancient storytellers and custodians of oral traditions at Amber Fort. A performance at Amber Fort by the Sitar Ensemble of Shakir Khan and Azeem Ahmed Alvi from the Etawah gharana. The writers were at the Jaipur Literature Festival 2019 by invitation.